At the beginning of February 2019 Tehmina and I launched our new business, the Curatorial Research Centre. The words “curated” and “curator” have become fashionable in recent years, used by thousands to describe lots of different concepts. We help people to grasp the concept of curation, providing clients with advice, skills, facilitation and research. We also provide direct services, such as research in the cultural sectors, including historical research, 3D scanning and analysis, and advice to museums. Whilst much of our work comes from the cultural sectors – museums, galleries, libraries, archives and archaeology – we are working in other areas including retail, music and sound (think curated playlists), and helping people to approach curating in different ways. This website will become quiet for a while, as I focus my energies on the Curatorial Research Centre, but I hope to return to blogging about personal interests here later in the year. Visit the Curatorial Research Centre website to find out more. I’m pleased to announce that I have received a grant from the Arts Council England Developing your Creative Practice fund. Self-employed individuals within the arts sectors often find it difficult to conduct development projects to improve their skills or experiment with different techniques. There just isn’t the time. Or the money to pay for the time. It’s all too easy to get stuck heading in the same direction doing the same things, rarely learning or trying anything new. Now it’s time for me to be rather honest with myself! One of the weakest areas in my skillset is 3D scanning smaller objects. They’re tricky, and there are many different approaches to scanning them. I’ve just never had the time to get good at it. It’s frustrating, but I’ve never had the opportunity to just focus on just that – try it all out, fail, learn, get better, get good at it. I want to work with a museum and solve some tricky 3D scanning problems. And eventually I want to share some of the skills that I’ve learned with others. And I’ve always wanted to learn ZBrush to help me make my 3D models look better online. The software has a steep learning curve, but it’s a stunning tool, and there are some great tutorials available. I heard about the DYCP fund and decided to take the plunge and apply. Fast forward 8 weeks, and I received news that I was successful! So I will be spending a few days a week until May 2019 working on developing my 3D skills within the museums sector. This is a golden opportunity for independent people like me working within the arts sectors, and I am deeply grateful to Arts Council England for their support. 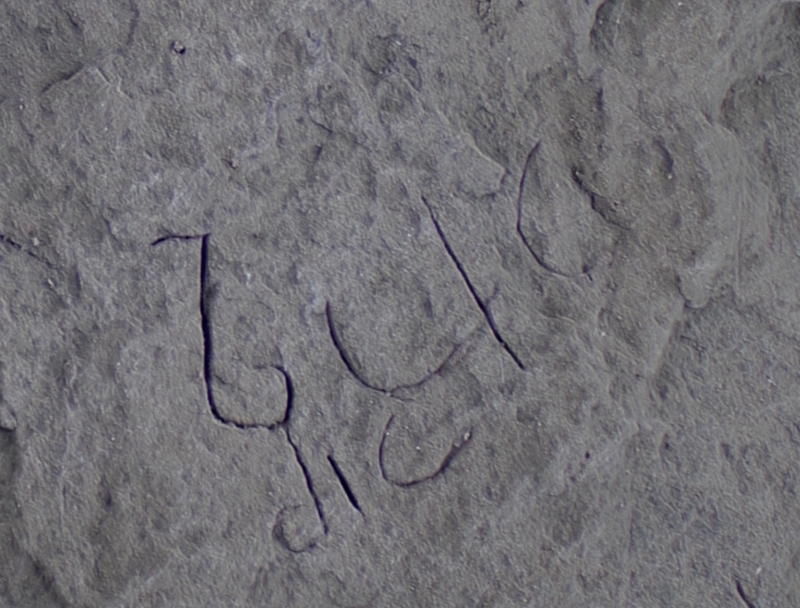 English Heritage have just announced the important and rare discovery of an early medieval stone inscribed with writing, dating from the 7th century. I was called in by Cornwall Archaeological Unit, who discovered the stone in the summer of 2017, to help enhance the inscriptions. 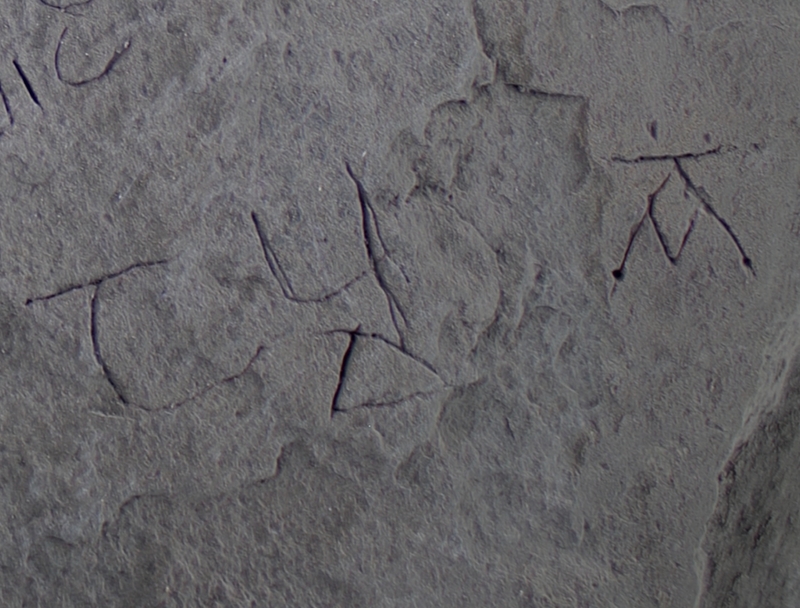 Some of the writing is very faint, and so rather than the usual technique of using 3D capture (close range laser scanning or photogrammetry), I opted to use Reflectance Transformation Imaging (RTI) to obtain our best chance of reading all of the letters. 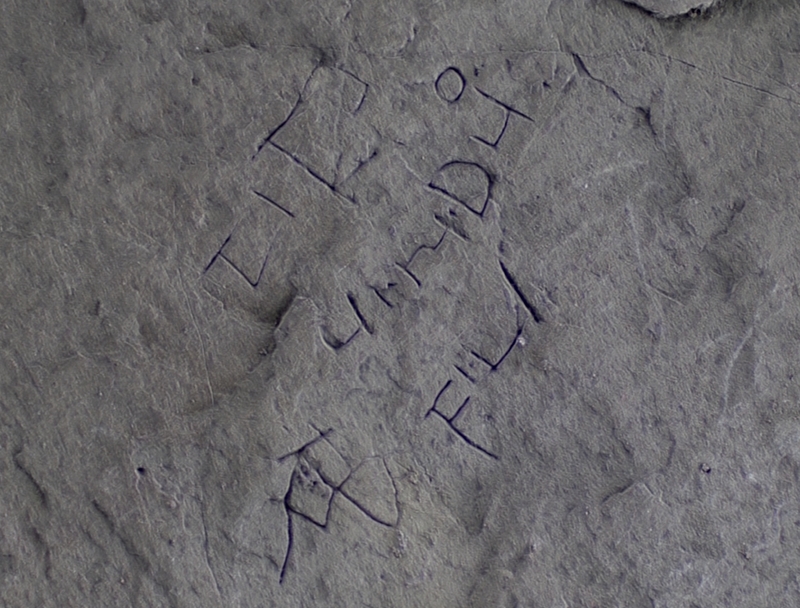 The results were fantastic, and I was lucky enough to be perhaps the first to read some personal names from 1,300 years ago, as I processed the data from my home office. There have been many calls via Twitter to see more of the enhanced images, so here they are (released under a Creative Commons attribution non-commercial license) with thanks to Professor Michelle Brown who conducted the interpretation and final transcription. There’s a great article on the Guardian which describes the Tintagel excavations and the significance of the discovery in more detail. In December 2017 I was asked by Helston Museum to train staff and volunteers in how to use photogrammetry to record their historic costume collection in 3D. The costume gallery had closed and become a much-needed storage area. They decided that online 3D models, and possibly through screens in the museum, would be an interesting and engaging way to present the costumes now in the museum stores. They could record and display many more than there has ever been physical gallery space for. The best way to capture the costumes is, of course, to use a mannequin. This would allow the costume to be viewed in the way it would have been worn, and rotated and viewed from any angle, an advantage over traditional static photographs. They would use Sketchfab to display the results. Helston Museum decided to try the project in a very public way. Training was conducted in their temporary exhibition space, with panels explaining what was going on to the public. Projectors were used to display the results, as they happened. Staff and myself were on-hand to answer any questions from the public. Over the course of a week, I trained both permanent staff, the Director and Assistant Curator, as well as a group of volunteers. 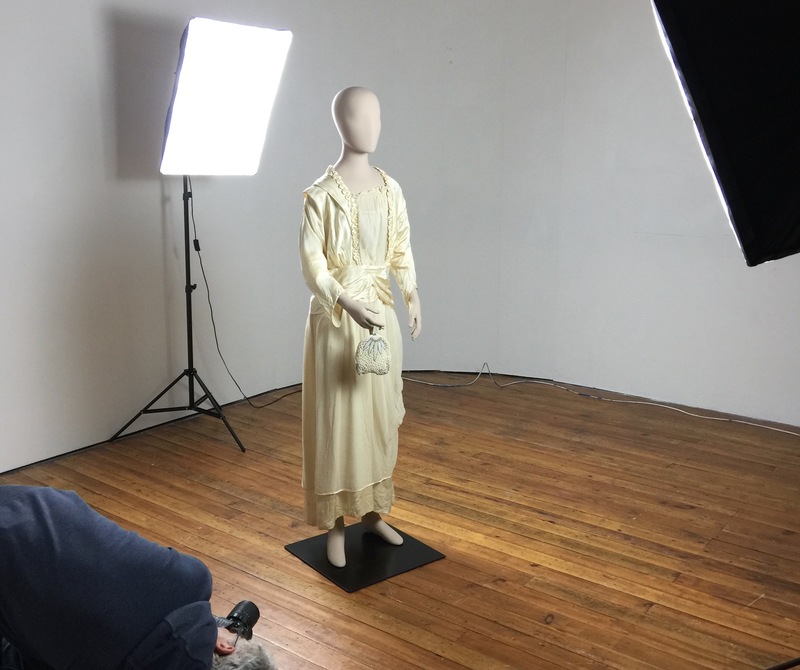 They were shown how to light the mannequins, how to photograph them for 3D photogrammetry, and how to process and clean the 3D data on one of the museum’s existing PCs. Some volunteers were more interested in photography, others in costume handling, and others in data processing and editing. I worked with their strengths, and the museum now have a great team to take the project on themselves. I remain available for questions from the team, and hope to teach some more advanced methods as they gain experience and confidence with 3D digitisation. Helston Museum are Cornwall’s first museum to create a Sketchfab account, where they will share the results of this ongoing project. Visit Helston Museum on Sketchfab. Last year (2016) I was asked by Dr Andy Jones from Cornwall Archaeological Unit to record and study the surface of Hendraburnick Quoit on Bodmin Moor in Cornwall. The work, funded by Cornwall Archaeological Society, involved detailed 3D recording of the surface of the two stones that comprise the monument (which isn’t actually a quoit, more a ‘propped stone’). It was a complex task for which I used photogrammetry as the 3D scanning method. It involved careful planning and then taking many hundreds of high resolution photographs to guarantee coverage at an even resolution across all sides of both stones to enable careful study with millimetric levels of accuracy. Our research was covered in the Telegraph who used the curioisty-grabbing headline “Ancient stone monuments may have been used for mysterious moonlit ceremonies, say archaeologists“. A full account of the project and our interpretation of the site can be found in the article Hendraburnick ‘Quoit’: recording and dating rock art in the west of Britain in Time & Mind – the “Journal of Archaeology, Consciousness and Culture”. 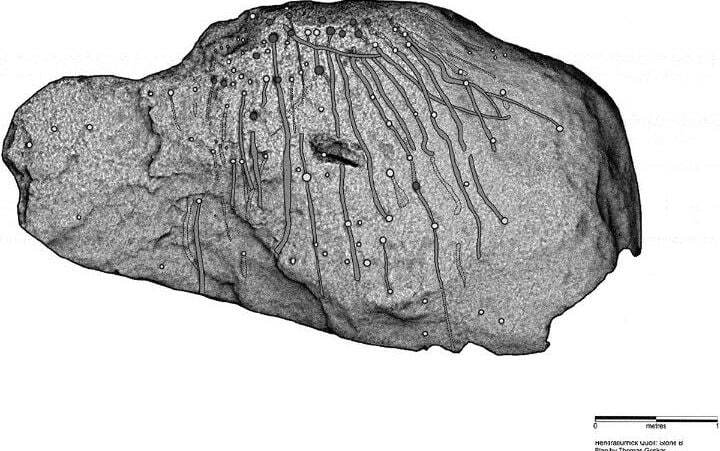 After processing the 3D data I began the lengthy task of analysing the surfaces in great detail. Each potential feature was subjected to four checks using alternative methods, including virtual RTI and cross sections. I burnt a lot of midnight oil ensuring finding ‘cup marks’ and tracing the grooved lines that connect many of them together. I found 105 cup marks and 47 possible grooved lines connected or radiating from them, following the slope of the stone. This suggests that the lines were made in-situ rather than before the stone was moved in prehistory to its current location. This makes Hendraburnick Quoit the most known decorated or deliberately marked stone in southern Britain – possibly topping even Stonehenge in number of human-made features (152) on its surface. A very reduced resolution model of Hendraburnick can be viewed on Sketchfab, to aid understanding of the monument. This year has been a strange one so far. The first months of this year saw me suffering from chronic back pain, and finding the road towards being pain free. I’m on that road, but not at the end of it yet. So, a bit of a setback. I’m typing this on my new sit/stand electrically adjustable desk perched on an ‘active’ stool, standing on a soft rug. Some will view this as laughably hipster, others with back pain will know that anything is worth a try. It’s definitely helping. Now that I’m easing back into work, I’ve got a number of projects underway. I’m working on another shipwreck project on the Isles of Scilly to create accessible tours of a group of wrecks, and I have a number of 3D archaeological recording contracts booked in. It’s always nice to do some gentle fieldwork. It might be a while before I’ll be able to dig again! 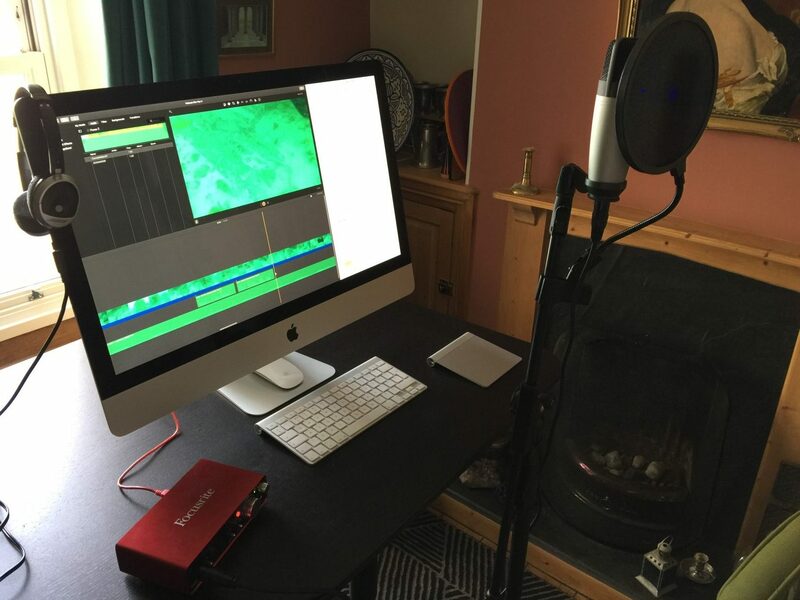 Recording a voiceover using a large diaphragm condenser microphone and Focusrite audio interface using a split-screen layout for video and script. Yesterday saw me recording a voiceover for a shipwreck dive video. It was nice to dust off some old skills and try out some new software. I think the result sounds good. I don’t particularly like the sound of my own voice, but I am used to it after years of recording podcasts. Along with a nearby colleague, I have undertaken another survey of the medieval Market Cross here in Penzance, where we have combined photogrammetry, Reflectance Transformation Imaging (RTI), traditional measured survey, and photography. We hope to produce the clearest possible images of the inscriptions and decorations and work with a specialist in medieval writing to see if we can provide an updated view of this important monument. 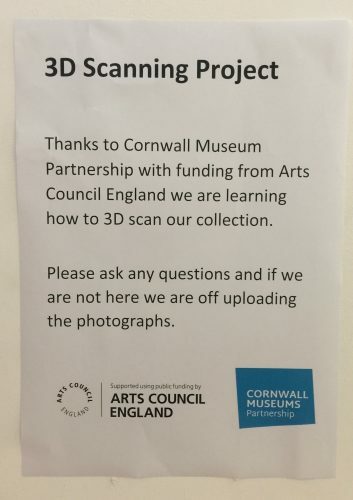 I’m also planning some meetings with museums in Cornwall to introduce the idea of 3D recording and public dissemination of their collections via Sketchfab. There are so many wonderful objects in the stores of Cornish museums, rarely if ever being displayed. As 3D scanning becomes easier, and the benefits are realised, I’m sure that this will become a rapidly growing area. I have my first meeting on Monday at a small museum that punches well above its weight. Tehmina and I are planning a month-long trip to New Zealand this July/August, which is part of her work as Cornwall’s ACE supported Changer Makers programme. We will visit many of New Zealand’s museums for Tehmina’s research, and I hope to investigate how technology is being used to record and interpret the shared pasts of the diverse groups of people who live there. So, now we’re nearly half way through 2017, here’s to a productive and enjoyable, and hopefully more spinally flexible rest of the year. With any luck, and I say this each year, I’ll write a little more. I have just completed a project creating an interactive diver interpretation for the wreck of HMS Colossus with marine archaeologist Kevin Camidge. Commissioned by Historic England, we have created a mobile-friendly website where divers and non-divers alike can explore the wreck. It is situated south of the island of Samson on the Isles of Scilly, and sank in 1798. As the Colossus is in relatively shallow waters, it is a popular and accessible location for diving. A physical dive trail already exists; concrete stations around the site on the seabed with tethered and numbered buoys and an accompanying guide. To help divers plan a visit, and to provide non-divers with a sense of what the site is like, we have created an “interactive plan”. Utilising Sketchfab, visitors can explore a simplified model of the wreck via computers, tablets and smartphones, tapping the dive stations to explore different locations in more detail, as well as viewing “diver-eye” videos of the site itself. We opted to create a simplified 3D plan based on the archaeological survey, clearly indicating in bold colours the different components of the wreck, rather than adopt a photorealistic approach. The wreck itself is a mass of seaweed and sand-covered dark wood which can be difficult for the layperson to interpret. Explore the wreck of HMS Colossus – dive in literally or virtually! Using 3D data (LiDAR) collected by the Environment Agency through the Government Open Data initiative I have created an interactive 3D model of the town centre of Penzance, Cornwall. It’s a very detailed model, with a measurement point every 50cm or so across the entire town. There are 12.9 million vertices (points) in this model. You may need a reasonably modern computer for the model to work correctly, but give it a try. Use your left mouse button to rotate the model, right-hand button to pan, and the scroll wheel (or equivalent gesture) to zoom. View this model directly on Sketchfab, where you can try full-screen mode. If you get too close to buildings you may notice that you can see the ‘points’ that the model is made from. In the future technology will allow agencies to collect much more accurate and dense data, and faster computers will allow us to view more detailed models. Until then – enjoy! LiDAR data is extremely useful to archaeologists to identify features in the landscape. This is my primary use of such data. In the future data like this will be useful for understanding how our towns have changed. This model is presented here for a bit of fun, and to demonstrate the many uses that this kind of data can have. 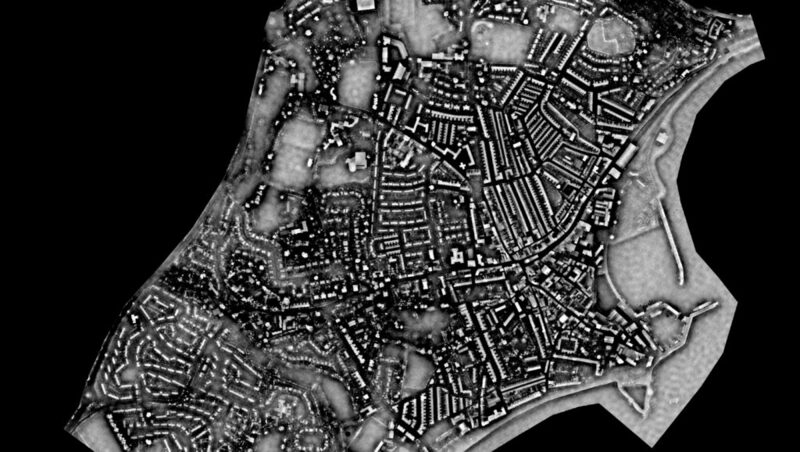 Penzance LiDAR with Ambient Occlusion to show streets and features more clearly. In August 2015 I was commissioned by National Maritime Museum Cornwall to produce a 3D printed replica of the late medieval bench end in the church of St Senara in Zennor. It depicts a mermaid, which is famously known as the Mermaid of Zennor. This has, along with another medieval bench end, been incorporated into a seat called the “Mermaid Chair”. The replica was for an exhibition entitled “Mermaids: Women at Sea” highlighting the achievements of female sailors. Naturally, people would expect to also see a mermaid – a legendary woman of the sea – as part of the display. The concept was to produce a half-size replica, which would be mounted upon a large photograph of the church interior. The 3D print would be positioned exactly over the portion of the photo occupied by the original – a collage of 2D and 3D. Visitors would be encouraged to touch the exhibit – something that should not be encouraged with the original medieval frieze. Before any work was undertaken, we sought permission from the churchwardens. They were keen to hear about the capture methods and learn more about the exhibition, and kindly gave us the go-ahead. I used photogrammetry – a form of 3D capture that uses photographs – to capture the entire bench-end. Using natural light only a tripod was necessary to compensate for the long exposure times. Before commencing the capture I planned my visit with advice from the churchwarden, when there would be no direct sunlight pouring in through the stained glass. This is essential for correct colour capture, pretty as that may have looked. There were many challenges with the capture in-situ in the church. Aside from technical challenges, St Senara is a well-visited church, and everyone wanted to see the mermaid. And to find out what I was doing. So it took a little longer than I had hoped, as it is always good to explain what’s going on to curious visitors, but the results turned out very well indeed. The resulting model consisted of tens of millions of measurement points which were used to create a highly accurate and ‘watertight’ 3D model. Given that the rear of the mermaid bench-end would be fixed to a display panel, the model was altered to create a smooth plane on the reverse to aid mounting. After preparing the model for 3D printing (checking the model for errors that could confuse a 3D printer) the data was sent to ThinkSee3D for printing. The resulting replica would be half actual size (182mm x 380mm x 20mm) – full size (370mm x 755mm x 40mm) would have been prohibitively expensive and would need to be printed in two parts then glued together. It would be printed in full colour using a solid gypsum-based resin. After some small test prints and experiments with colour, and a coat of varnish to replicate the finish of the real medieval wood, the finished 3D replica of the Mermaid of Zennor was ready. Museum staff mounted the print carefully over one of my photos – the result was rather effective! 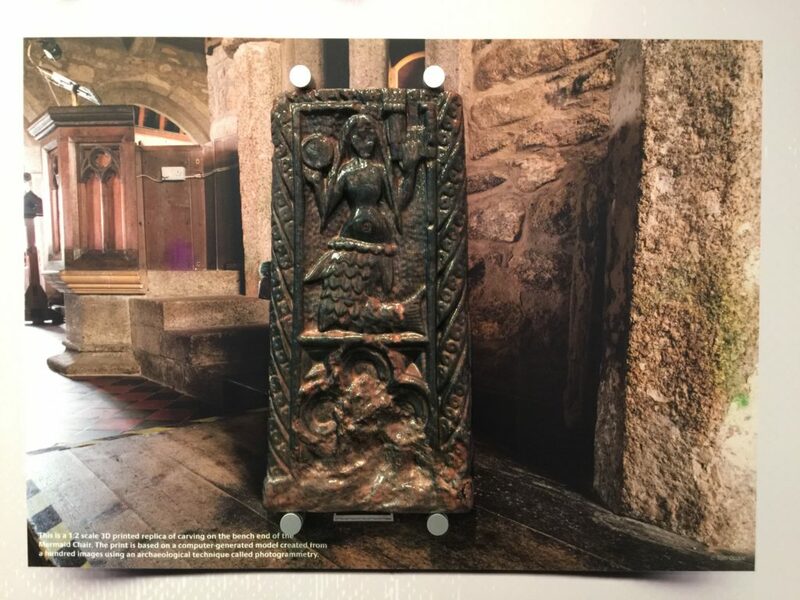 3D printed replica of the Mermaid of Zennor medieval bench end mounted over a photograph of the real bench in the church of St Senara. Since the Mermaids exhibition ended at NMMC, the 3D printed replica has gone on show in the “All Monsters Great and Small” exhibition at the Royal Cornwall Museum. When I first started out with learning 3D visualisation techniques and software back in 2001 I longed for a way to share my models online. In the early days there was VRML and other, proprietary, methods (Superscape, Shockwave 3D, etc) but these required either big browser plugins with limited capabilities or in the case of VRML, very low polygon (simple) models. My 100,000 polygon reconstruction of the Tudor palace at Oatlands which I built from archaeological and contemporary visual evidence was never going to make it online back then. Without providing a history of the technology used to present 3D models online – I’ve probably tried most methods through the years – we now have a splendid service called Sketchfab. I’m certain that someone has used the YouTube analogy here. Putting video online used to be hard until YouTube and the many similar services that came and went. Now you can open a Sketchfab account, upload your models, edit how you’d like them to initially appear, and share your links or embed them in your website or social media timeline. There are many sophisticated tools to change how your model appears, from its textures, to the environment and lighting, background photo, visual effects, and interactive annotations. In the world of cultural heritage Sketchfab opens up a whole range of possibilities. Annotations allow numbered points to be attached to geometry and through the use of Markdown, those annotations can include embedded photos and hyperlinks. Here we see a model of Hoa Hakananai’a from the British Museum’s Sketchfab account (3D capture by my colleagues at Archaeovision) with annotations to explain some of the carvings on the statue. I’m currently working on an interactive plan of a shipwreck where annotations contain links and are used as the launch to pages with further information. It’s a really nice way to explore it without, or indeed before, any diving. Sketchfab also contains a really good user community, including a dedicated cultural heritage group. There’s always room for improvement. I’d love to see a point-to-point measuring tool, and I hope that the download facility one day allows for charging for models – that way people who can’t afford to give away their content can perhaps earn a bit of income, which could be good for freelancers and for Sketchfab via a commission model. Other than that, Sketchfab is pretty amazing. Go and sign up – it’s free. Here’s a lovely statue-menhir from the island of St Martins on the Isles of Scilly that I scanned in 2015. Sketchfab’s now ubiquity allows models to be embedded within WordPress by just pasting the link into a new line in the editor. Very handy.